What is the state of Christianity today, and what might it look like in the future? In the West, the story for a long time has revolved around decline and the loss of monopoly status, but how are these shifts changing the practice of Christianity or individual belief? Similarly, the rapid growth of Christianities in the Global South has been well reported, but the continuing complex intersections of mission Christianity with indigenous religions are less well known. Large-scale flows of people across increasingly fluid borders mean that not only does immigration sometimes significantly boost Christian numbers in a given country, but that different forms of Christianity shift traditional religious landscapes. How will emerging trends such as 'reverse mission' from the Global South affect Christianities in areas more used to sending rather than receiving missions? As the majority of believers shifts from the West to the Global South, how will issues such as homosexuality be played out theologically, politically and individually? Will new virtual churches manage to create viable long-term communities? How does new festival Christianity function in the religious life of an individual? The divergent and oftentimes contradictory state of Christianity in the modern world fuels questions about its place and future in the world: in politics, education and healthcare. 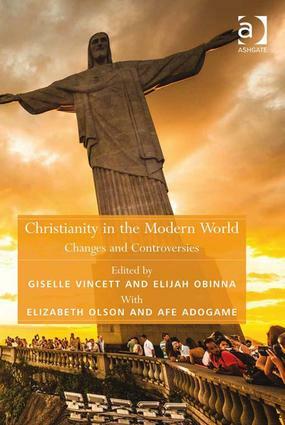 This book brings together cutting edge research on the most recent changes and trends in Christianity worldwide. Contributors drawn from the USA, UK and Europe, Africa and East Asia offer an invaluable breadth of coverage, expertise and disciplinary perspective at the intersections between sociology of religion, theology, politics, education and human geography. Contents: Introduction, Giselle Vincett and Elijah Obinna; Young people and golden rule Catholicism in the Philippines: the case of religiously involved Filipino students, Jayeel Serrano Cornelio; The dis/embodied Church: worship, new media and the body, Tim Hutchings; Refugees’ encounters with Christianity in everyday life, Bereket Loul, John Willott and Simon Robinson; African Christians in Scotland: contesting the rhetoric of reverse mission, Elijah Obinna; Sexuality and Christianity: understanding the attitudes and negotiations of young adults in the UK, Sarah-Jane Page; Contemporary evolution of monasticism in Italy, Stefania Palmisano; Catholicism in transition: the ’religious beat’ movement in Hungary, Kinga PovedÃ¡k; When religions of difference grow softer, PÃ¥l Repstad; Contesting meaning and gender: the role of Christianity in an African indigenous religious festival, Dodeye Uduak Williams; Index. Dr. Giselle Vincett researches contemporary religion in the UK. Her most recent work focuses on young people and religion in the UK and examines how traditional religion is changing amongst young people and shaped by social, geographic and economic contexts. Her most recent journal article from this research, 'Young People and Performance Christianity in Scotland' is forthcoming in the Journal of Contemporary Religion. She has previously edited a book in the same series for Ashgate (with Kristin Aune and Sonya Sharma) entitled Women and Religion in the West: Challenging Secularization (2008). As the current publications officer for the British Sociology Association's Sociology of Religion Study Group (SOCREL) she is series editor for the Ashgate series 'Theology and Religion in Interdisciplinary Perspective'. Dr. Elijah Obinna obtained his PhD from the University of Edinburgh, United Kingdom with specialisation in Sociology of Religion. He is currently a senior lecturer and the director of Research and School of Postgraduate Studies at the Hugh Goldie Lay/Theological Institution, Arochukwu (HGLTTIA) in affiliation with Abia State University, Uturu. From 2011 to 2012, he served as a visiting assistant professor at the University of Missouri, Columbia, USA. Obinna is the author of Scottish Missionaries in Nigeria: Foundation, Transformation and Development (1927-1944) (The Edwin Mellen Press, 2013). Additionally, Obinna has authored many articles and book chapters in international publications. He is the author of the forthcoming book entitled Church and Society in Nigeria: Socio-Religious, Gender and Economic Structures in Change.